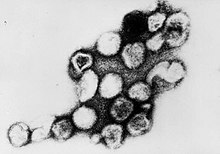 Rubella (also known as German measles) is a disease caused by the Rubella virus. It is often mild and an attack can pass unnoticed. However, this can make the virus very difficult to diagnose. The disease can last 1–5 days. Children recover more quickly than adults. The virus usually enters the body through the nose or throat. Like most viruses living along the respiratory tract, it is passed from person to person by tiny droplets in the air that are breathed out. Rubella can also be transmitted from a mother to her developing baby (fetus) through the placenta. This can be very dangerous to the fetus, especially if the mother gets rubella early on in her pregnancy. Rubella can cause deafness, heart problems, intellectual disability, and many other problems in developing fetuses. The virus has an incubation period of 2 to 3 weeks during which it becomes established. Common symptoms are a red/pink rash, swollen lymph nodes, and a high fever. The disease is named German measles because it has a similar red rash to measles and was first described in detail by German doctors. On April 29, 2015, it was announced that rubella has been eliminated in North American and South America. A scientific group of experts said it took 15 years of work for this to happen. Among the groups are: Pan American Health Organization, United States Centers for Disease Control and Prevention, UNICEF, and the United Nations Foundation. ↑ Donald G. McNeil, Jr (29 April 2015). "Rubella Has Been Eliminated From the Americas, Health Officials Say". The New York Times. Retrieved 4 May 2015.